Use the larger sized KitchenAid Artisan 5KFP1644B 4L Artisan Food Processor Mixer for professional results to slice, chop, grate, purée and blend a variety of ingredients. 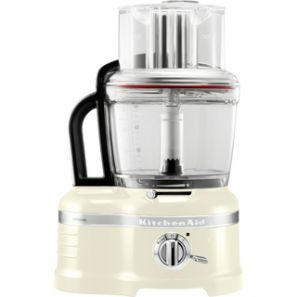 The classic-style premium Artisan large 4 litre food processor from KitchenAid is versatile and durable, retaining the high quality design and performance KitchenAid is known for. This high quality food processor features a die-case metal construction making it robust and built to last. The ExactSlice system allows you to manually adjust slices from thick to thin without opening the lid, using the external lever to give you precise, accurate slicing for soft and hard foods. Three feeding tubes ensure you can slice foods of a variety of sizes and add each ingredient gradually. Featuring uniquely-designed sharp blades and two optimised low (700 RPM) and high speeds (1600 RPM). Includes a work bowl, prep bowl and mini bowl so you can process batches of various sizes quickly. Comes with a three year guarantee covering parts and 20 years for the motor. Exact Slice System: adjustable slicing disc with first ever external lever to adjust the size of the slice without disassembling the machine to change the blade size. Please note we do not readily carry stocks of this colour in the 5KFP1644BAC range but we would be delighted to order it on special expedited delivery. Please allow 2-3 weeks for delivery of this item. In exceptional circumstances for periods any longer we will contact you immediately and advise if there will be any further delays.